The depth of the touch is checked for each key individually. Differences are adjusted by putting paper washers underneath the touch baizes. 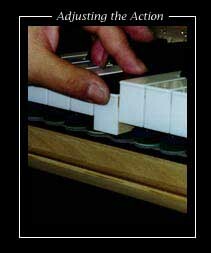 The height of the keys is adjusted by putting paper washers underneath the balance pins. This process is repeated 3 times before the instrument leaves the factory. The many parts of an action have to be carefully adjusted to function with precision It needs a true eye and skilled hands to achieve this.